I walked all day, more than I ever have before or ever will again. Up steep forest paths, along by babbling brooks, across fields of barley, through farmyards and back and forth over a railway line, I walked and walked as far as my legs could carry me. And then I stopped, defeated. 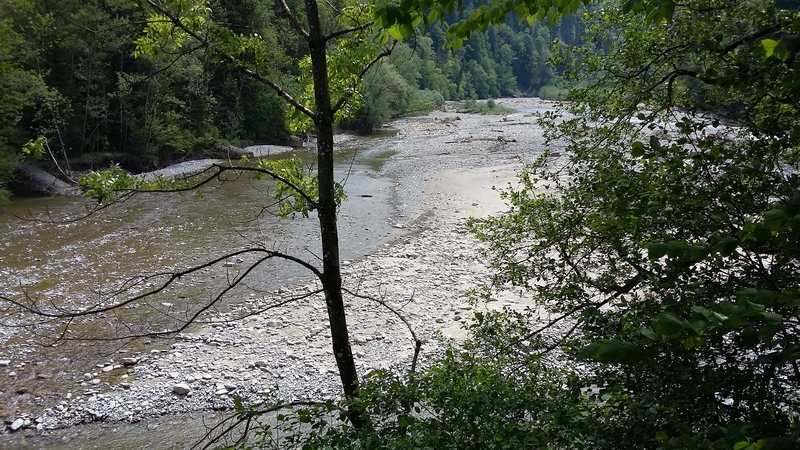 I had reached the outskirts of Bern and I had two pressing problems – my feet. You see, the walk didn’t exactly go according to plan. 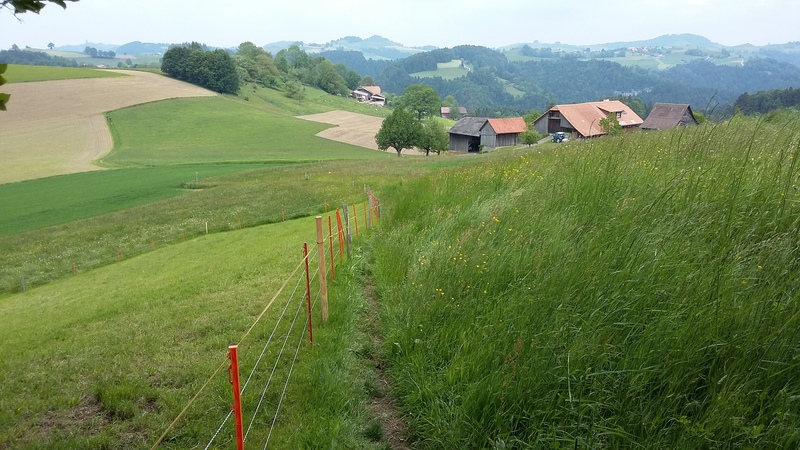 The plan was that I would walk from my home in Fribourg to my old place of work in Bern – a distance of 40 kilometres – over two days. 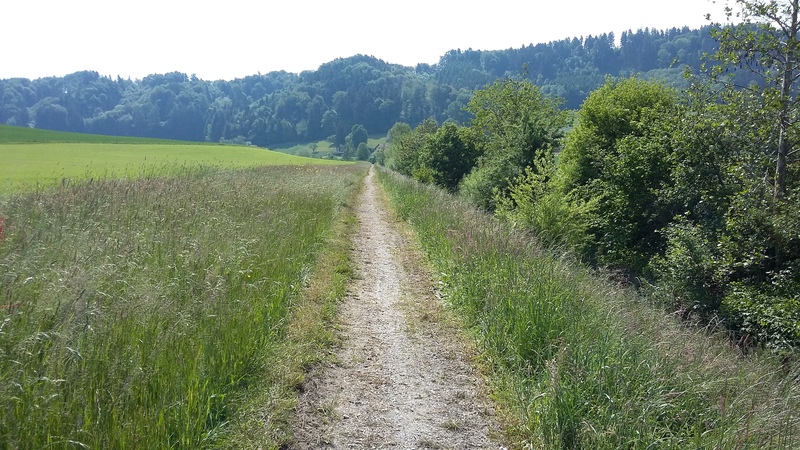 The first half of the walk would take me Schwarzenburg, covering part of St Jakob’s Weg, the pilgrimage route that leads from Konstanz across Switzerland and France to Santiago de Compostela. I left home at 9.30 in the morning, having delayed as long as I possibly could when I was hit by last minute nerves. 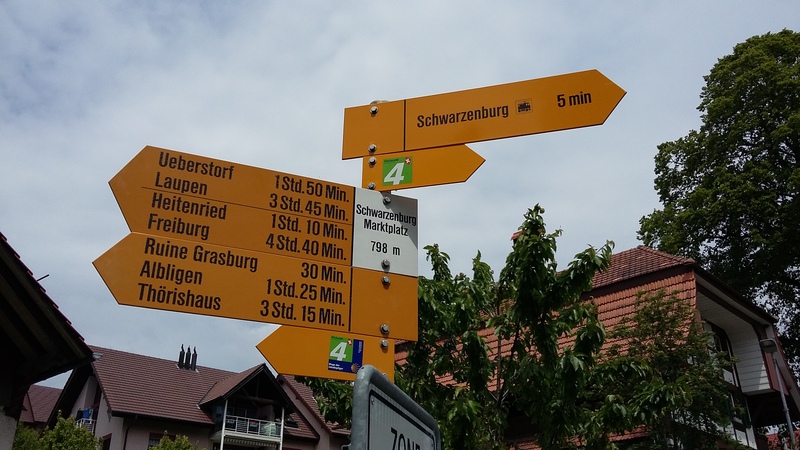 Five hours and eighteen kilometres later I was sitting in a bar in Schwarzenburg, sipping a beer and studying the map. I felt well, the pains in my legs and feet were tolerable, and it was clearly too soon to stop. But could I do the same distance again to reach my final destination? I had to give it a shot. Walking alone over a long distance is a great way of being present in the moment. The senses take over, the awareness of your own body going about its quiet work of being alive. You look at the ground, you look at everything alive and growing, you look at the horizon. The landscape is gracious, letting you pass – at times opening up far and wide, all rolling hills, woods and meadows; at times closing in to usher you through corridors of stone or dark tunnels of green. It was a windy day, an east wind with a cold bite known as the ‘bise’ in this part of the world. I ate my lunch in a sheltered spot at the edge of a wood near Heitenried and watched the wild wind rushing across fields of barley. I was thankful for the sun which kept up a regular appearance all day. An hour and a half after Schwarzenburg, I stopped for a break at an old restaurant beside the bridge and railway station of Schwarzwasserbrücke. According to the hiking signs that I had come to depend on, I had two and a half hours to go. When I stood up my legs were so stiff and sore I half-waddled, half-hobbled out of the place. I felt a pain on the sole of my foot that made me unwilling to take my boot off. The ankle on the other side was already a problem area. I pressed on and the aches faded for a while. Over the next two hours I crossed some of the loveliest country, farmed in peace for generations. That is the ultimate prize every country should be so fortunate to have. I had my route printed out on ten sheets of A4 paper. On map eight I was still enjoying the view but by map nine I didn’t want to look up anymore to see how painfully slowly I was approaching the next village. The turning point was Niederscherli. There’s a wonderful approach to the village across a wide area of pasturage called Rifishalte. That part I appreciated. Also the two sweet boys on skateboards who helped me get on the right road out of Niederscherli towards Gasel. But that interruption cost me. A small eternity of twenty minutes later, I limped past Gasel and set my sights on Schliern, every step a trial. I will not forget these places. There was no possibility of me walking another hour or more across the city of Bern to get to my original destination of Ostring. In Schliern I saw a smartly-dressed old woman going in to a restaurant, every inch the widow. I longed to follow her. It was seven o’clock on Saturday night and I had walked well over thirty kilometres since morning. I turned a corner and saw a bus, a Bern city bus sitting at its terminus, a most welcome sight. That’s where my walk ended. The bus was due to leave in three minutes. I bought a ticket from the machine, the best two francs I’ve ever spent, and allowed myself to be carried in total luxury four stops to Köniz. All that was left to do was to call my trusty driver to come and get me, and sit content and patient in the last of the sun. I was ready to go home. sounds like a beautiful painful walk. That’s a good way of putting it. All would have been fine if it had just been a little shorter. Thanks for stopping by! Well Clare, you did what you set out to do…your body may not have made it all the way, but the rest of you did! The human spirit travels much farther than the feet it rests upon…that’s why a good walk alone will always involves a bit of “soul searching.” I enjoyed your adventure; thanks for sharing! Thank you Marc! It was an adventure and proved to me that it’s always good to seek out new experiences. So proud of you, Clare! A walk to remember and appreciate. As time passes, you’ll swiftly forget the blisters, pain and fatigue, only to recall the glorious scenery, ideas thought through to the end, plans forged and that chuffed feeling of having achieved what you set out to do. Wonderful! Thanks Marius! It was an unforgettable day and gave me a great sense of achievement. Not talking for most of the day was also a bonus. I talk too much and it’s a distraction! Next article Can journalists make the switch to fiction?